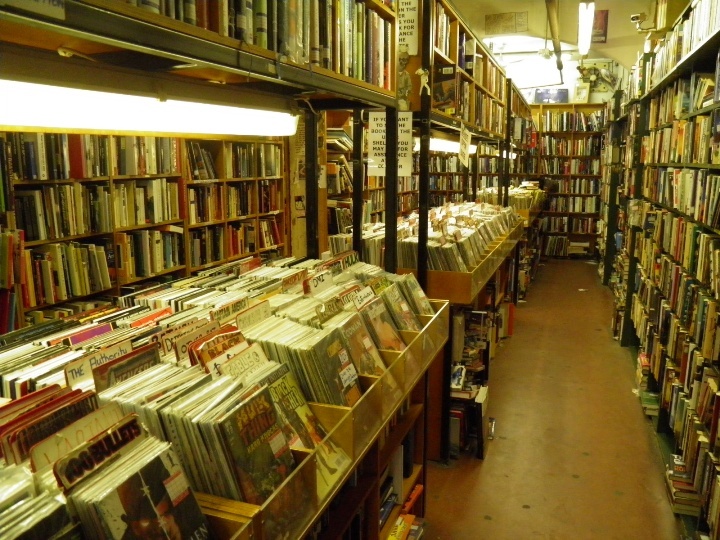 As a long-time comics fan, there’s nothing I enjoy more than conjuring up mental images of how comic shops used to be. 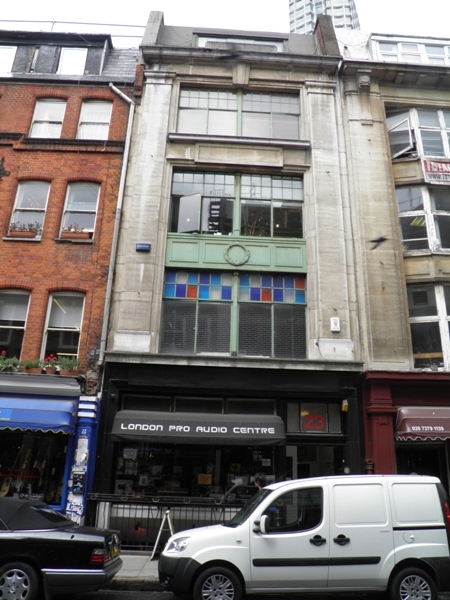 When I was nine-years-old, the original Forbidden Planet comic shop at 23 Denmark Street was simply the most magical place on earth. I only have to see a glimpse of the Brian Bolland artwork which used to adorn the plastic bags (and the associated t-shirt my dad bought me on one trip) and I’m straight back to the uneven wooden floor, the smell of pulp paper, the shafts of light streaming through the dust which hung in the air, and the vague unease of my mum as the till rang through each 75p I’d spent on the recent releases. 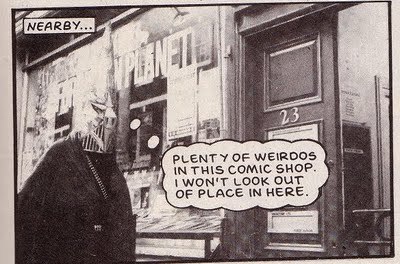 The store first opened in 1978, the third of the dedicated comics shops in London following Dark They Were And Golden Eyed in Soho and Weird Fantasy in New Cross. 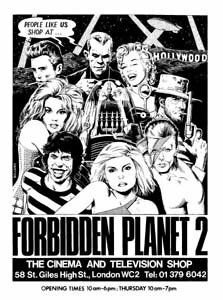 The original Forbidden Planet was owned by Nick Laundau, a former sub-editor of 1970s British comics 2000AD and the war title Battle. He went on to establish Titan Entertainment, a company distributing imported the US comics which were previously only sporadically available at British newsagents. 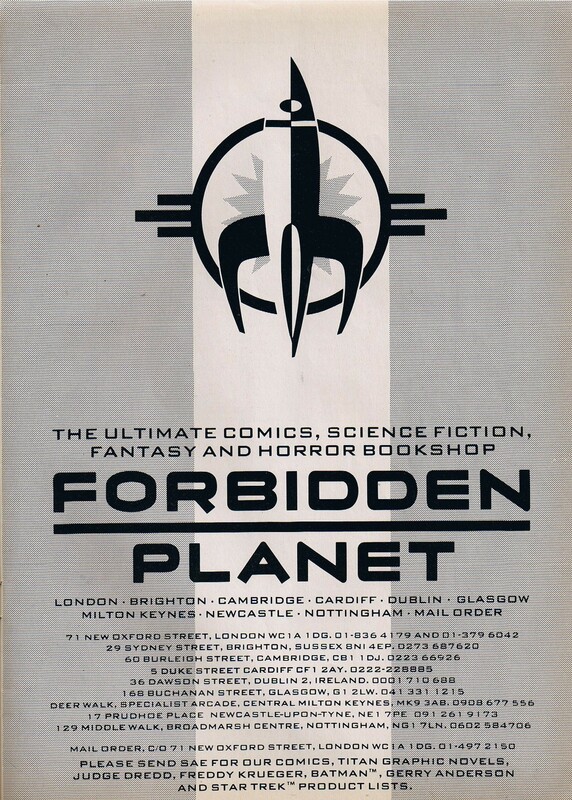 Today, Laundau is no longer the owner of the Forbidden Planet chain, but remains with Titan Books, now a vast publishing company specialising in TV tie-in books and magazines. Just round the corner from the original shop on St Giles High Street was FP2, which, despite it’s claim in the poster above to be “the cinema and television shop”, I recall being stuffed full to bursting with sci-fi novels. 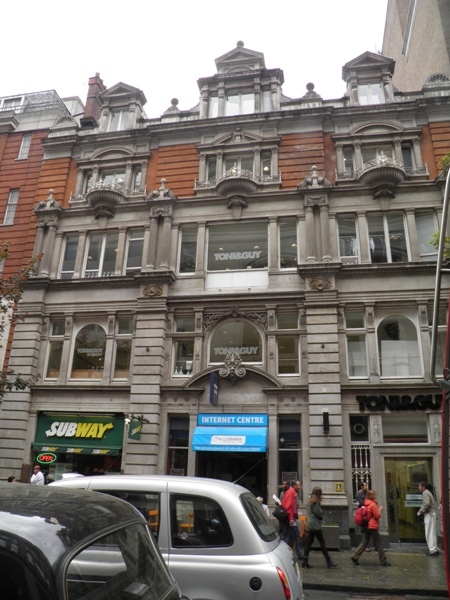 The two shops combined and moved round the corner to New Oxford Street in the early 1990s, forming the country’s first Comics and Sci-Fi Megastore. It was a boom time for the comics shop – a new generation’s rediscovery of the Star Wars films and the announcement of an upcoming prequel, a mania for TV hits like the X-Files, and a runaway speculator’s market of limited edition comics and cover variants, meant that comics and pop culture had never been more mainstream. 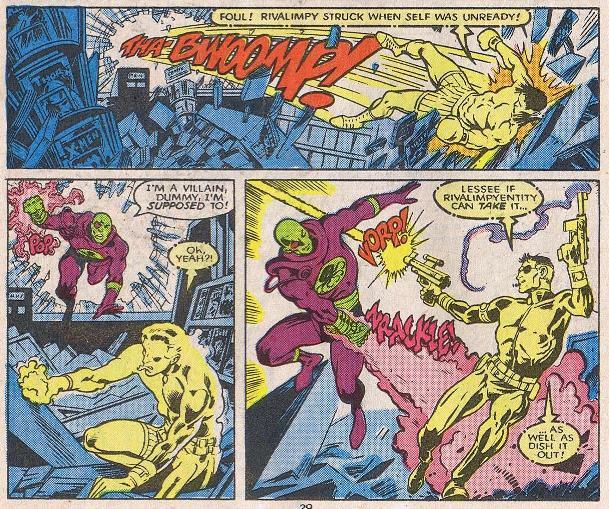 Blinded by the record profits that the mania for collecting generated, the comic companies made a terrible mistake; they forgot to make their comics any good. While they would happily produce six different front cover designs for every single issue, they completely forgot to deliver the goods inside the covers. 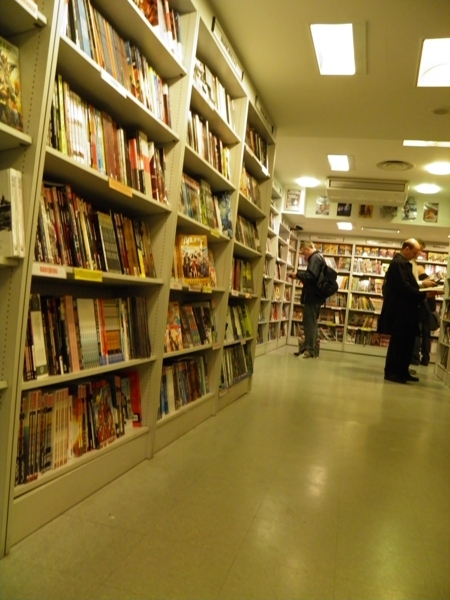 As the writing and artwork inside the comics plummeted, so too did the numbers of readers. 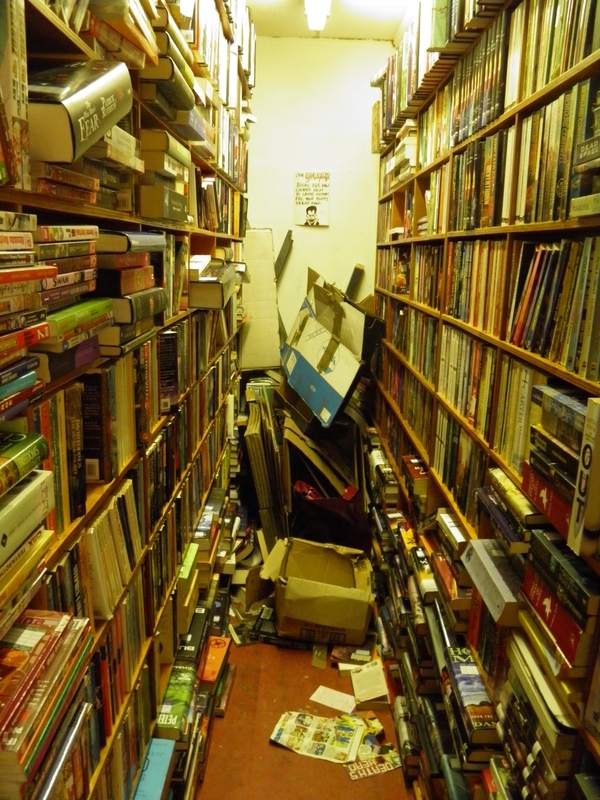 Copies which were once highly prized collectables became impossible to shift from the shelves. The speculators and collectors all retreated, and many of the smaller comic companies who’d been riding those waves folded almost instantly. 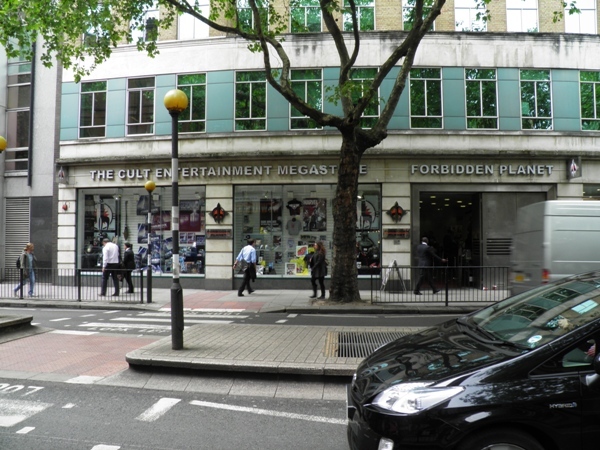 It’s no surprise that, of the dozen or so mainstream comic shops operating in London at this time, all but the Forbidden Planet have since shut up shop. 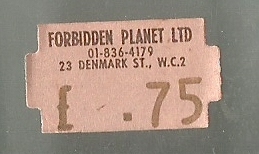 Now pretty much the sole vendor in town, Forbidden Planet moved to its present, even larger location at 179 Shaftesbury Avenue in 2003. I like the shop, but I can’t imagine it excites the minds of ten-year-olds like the original did mine. It’s very white, clean and tidy – a far cry from the sense I used to get of hunting for buried treasure in the scruffy old shop located down a rather insalubrious side street. In fact, with all the silent men in their forties flipping morosely through leaflets, it looks a little bit like a private medical facility where all the health information pamphlets star Spiderman. There’s still a shop in London that conjures up the wonder of the early 1980s comic shops, however; the Comic and Book Exchange in Notting Hill. Everything about it is as perfect a relic of 1980s comic shops as you could ever imagine. The floor is dirty, the strip lighting flickers, and most importantly, it smells of cheap paper. 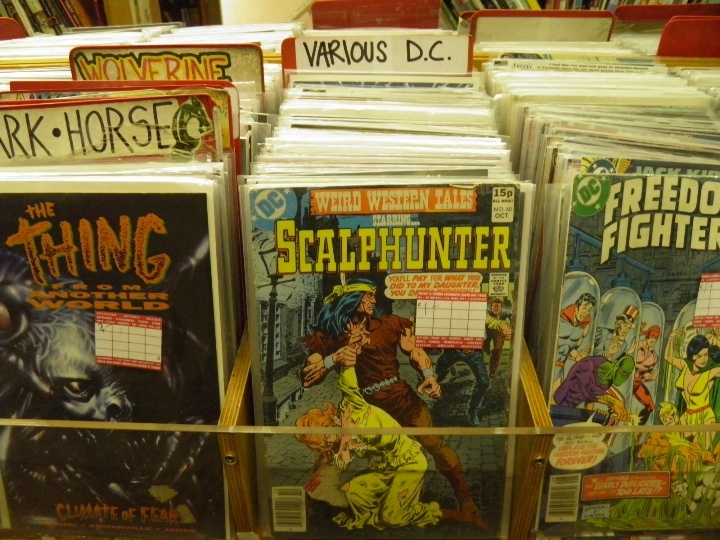 The racks are full to bursting with stuff you’ve never heard of, you can find amazing bargains, the signs are all handwritten, and the vast majority of their stock harks back to a time when comics had lurid, over-the-top covers created solely to encourage kids to pick them up. It’s odd that the last place to go when you get nostalgic for Forbidden Planet would be Forbidden Planet. 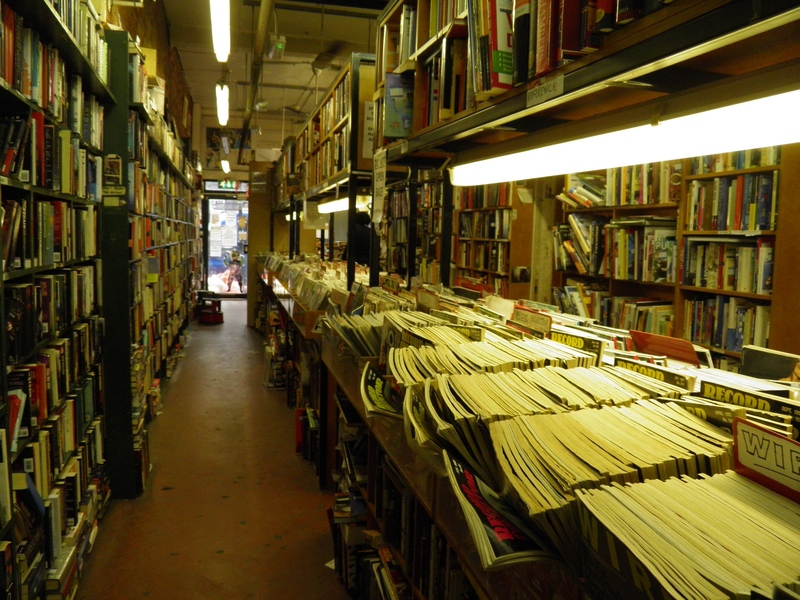 While FP might be the last of the London comic book stores to survive, the Notting Hill Book and Comic Exchange is the only one in London that feels like stepping back to the modern industry’s very earliest days. Today, I needed a glimpse of the original FP which used to be my mecca in the early 80s as a budding teen… thank you! Spent hours in original FP pouring through the original artwork of McMahon, Oniel. It was like £75 a page wishing I could afford it. piled from floor to my waist height. Gosh I wish I bough t some. Remember seeing the Watchman artwork coming up at £125 a page. It now goes for £15K on ebay a page. Great article and great photos. 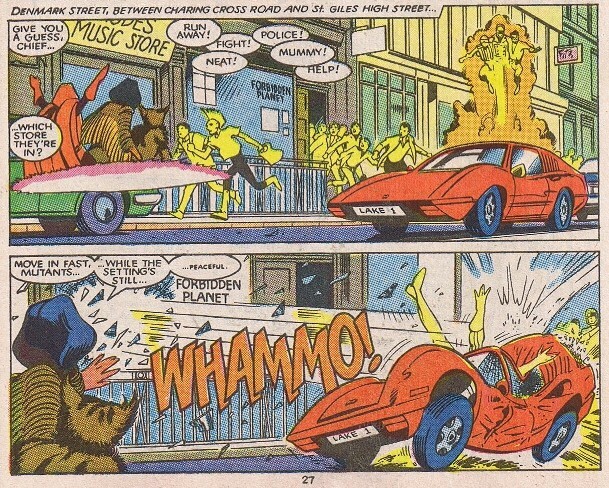 I’d love to visit the London store and check out their vintage comics. 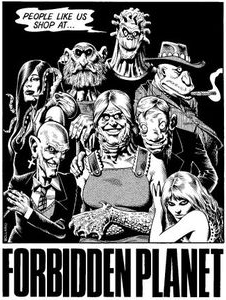 When I was in the UK in the 80s I always visited the Birmingham associate store Nostalgia & Comics, and more recently the actual Forbidden Planet store. I’m writing a short Word Press post on comic adverts featuring the Denmark Street address… is it okay if I link to your post? Wonderful. I don’t remember the original shops, but certainly the New Oxford Street incarnation, where I stood in a fair few queues for signings. Happy days! ” Forbidden Planet” in Denmark Street first comic shop I went to as a teenager back in the 80s and became a serious collector . I used to walk there from Streatham, so I could save money to buy pre general release issues of Marvel and DC comics every Thursday. I loved going there, it was an amazing, wonderful magical place, it was my second home, you could always talk about comics, writers artists with the members of staff. I remember chatting about Neal Addams, John Byrne and Frank Miller amongst many others. When they moved to New Oxford Street, a lot of magic was left in Denmark Street and I started going to “Comic Showcase” in Neal Street. Times change and I am pleased for the world wide success Forbidden Planet has become. which is reflected in its mega store in Shaftsbury Ave. 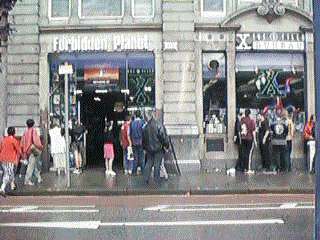 However, the old Forbidden Planet was a million times better than the cold, impersonal, corporate, Forbidden Planet in Shaftsbury Avenue.